This past weekend I bought a box of peaches. As you may recall, from previous posts, I love peaches. My dad used to buy boxes of peaches every fall to slice and put in the dehydrator. They would be set out on the dining room table, and the kitchen counter, and any other flat space, to ripen, filling the house with their lovely perfume. Then they would all ripen at once, and the kitchen became an unsafe place to be in the evenings, as he peeled and sliced peaches like a madman (well, OK, and time he is in the kitchen he is kind of like a madman, even if he is only making a sandwich), laying them out on dehydrating trays and dripping peach juice down the stairs and through the hallway to the dehydrator hidden in the storage room. Peaches bought directly from the farmer, as these were, and as were those long ago peaches, taste nothing like the mealy, rock hard one minute, over-ripe the next, peaches that you can buy at the store. As a result, canned peaches, dried peaches, and any other peach products all taste that much better. 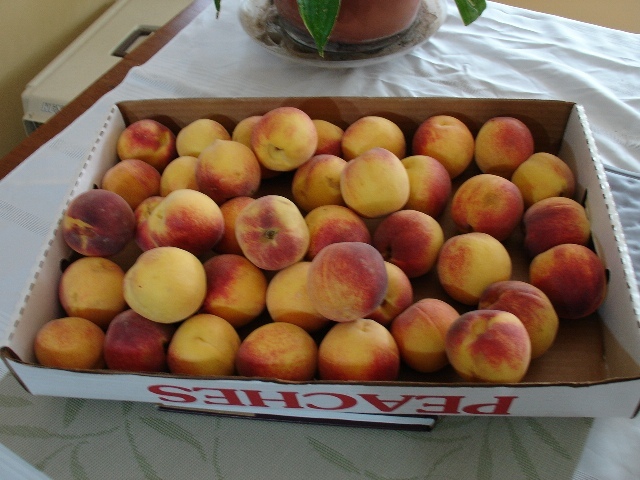 Anyway, I bought this box of peaches, and now I had to think of what to do with them all. I didn't really want to can them, although I like eating the results in the middle of January and remembering that winter doesn't last forever (especially not in Arkansas). 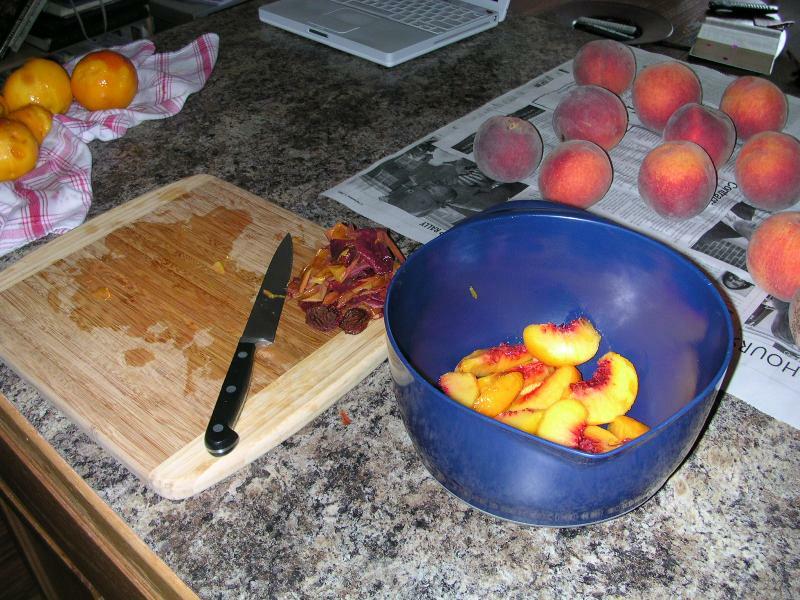 Cobbler is always a good option, but wouldn't use enough peaches to make a noticeable dent in the box. Then our friend Taine mentioned a recipe she had just seen for making boozy fruit - fruit marinated in sugar and hard alcohol. Canning without some of the fuss and mess of canning. Perfect. I found the general recipe at the New York Times and decided to give it a try. 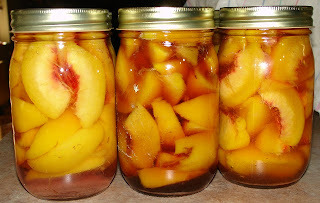 After a trip to the liquor store, I made six jars, two each, of boozy peaches in raspberry vodka, brandy, and rum. You will have to wait until December or January to hear how they turned out, since they have to marinate for 3 months before they are ready to eat (or should that be imbibe?). I also made a batch of peach frozen yogurt, which was divine. From several years ago, but the scene will be similar tonight. Of course, six jars of peaches and a half gallon of frozen yogurt also hardly make a dent in a 35 pound box, so I did the sensible thing and ordered a dehydrator. Well, maybe it wasn't entirely sensible - would have been cheaper just to can the darn things and be done - but I have wanted one ever since I moved away from home, and I do so love dried peaches... Excalibur (hey, that's the name on the box) arrived yesterday, and I will be spending my evening peeling peaches, slicing peaches, and getting peach juice all over the kitchen. YUMMY! Can hardly wait for Christmas. We're not in Phoenix, so cut it out!